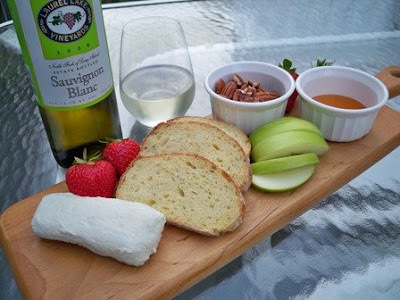 A seasonal spread featuring farmstead chevre goat cheese - flavored with lavender and honey - from Catapano Dairy Farm in Peconic, Long Island. It is the unofficial start of the summer season. 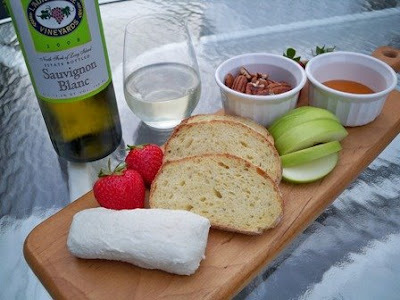 I celebrate the glorious weather by dining outside with a delectable spread of fruit, honey, nuts, Long Island wine and goat cheese flavored with a hint of lavender and honey from Catapano Dairy Farm in Peconic, Long Island. The fresh chevre cheese is alabaster white and decadently creamy. I spread it thick on slices of fragrant golden semolina bread with rosemary from Junda’s Pastry, Crust & Crumbs in Jamesport. The cheese is velvety smooth, with a seductive, rich mouth feel. It tastes bright, tart and sweet like country-fresh cream at dawn. For this moment of edible bliss, Karen and Michael Catapano have labored 365 days a year. Catapano Dairy sits on the North Road in Peconic, New York, in the heart of Long Island wine country. 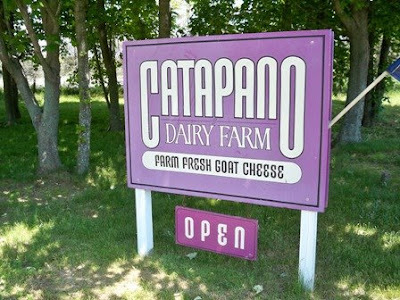 Catapano Dairy Farm has the distinction of being the only goat dairy on the North Fork of Long Island, and one of only two dairies producing farmstead cheese on the East End. One might actually miss the entrance sign, set beneath several large shade trees on the North Road, and nestled amidst a burgeoning wine industry. But, that would mean missing a chance to sample extraordinary goat cheese twice-honored with the highest award given by the American Cheese Society. When you talk with Karen Catapano, you appreciate that there is nothing effortless about creating award-winning artisanal cheese. It is a year-round effort. 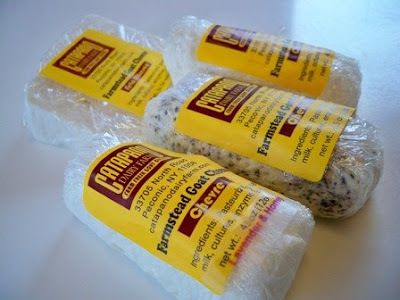 Assortment of fresh farmstead goat cheese from Catapano Dairy Farm. Karen is tall and slender with auburn hair. We sit down to talk in the midday sun at a café table adjacent to the animal pens. An occasional “Baaahh” floats musically through the air. Nearby is a small shop, painted robin’s egg blue, where the couple sells fresh goat cheese and premium soap made from goat milk. Shortly into our conversation, I am reminded that an artisanal cheese enterprise is also an animal husbandry operation, and quite labor intensive. When the couple purchased an existing dairy with 18 goats in Mattituck, Long Island in 2003, they discovered that the bucolic dream of dairy ownership and the intensive upkeep were often in conflict. Both were healthcare professionals, Karen a nurse and Michael a physician. Their personal interests seemed perfect for the venture. Michael had dabbled in cheese making and Karen was breeding dogs and cats. So they enrolled in cheese making and animal husbandry classes at a farm in upstate New York. Every day was a learning process. 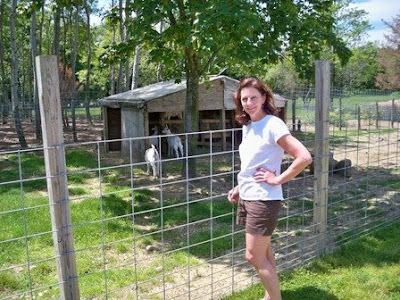 Karen Catapano with the goats at Catapano Dairy Farm. The investment of time and effort paid off. “We were working 24/7 to get it going and then the second year, we did very well. Everybody knew us,” she says. But, they were constantly adapting the existing dairy to new demands. In 2005 when Michael entered Catapano Dairy Farm Chevre in the American Cheese Society annual competition and won first prize for best goat cheese in the USA, the couple once again needed to reconsider their approach to the business. Success required further investment and expansion. They established the current dairy in Peconic in 2006 and are now beginning their fourth season on the property. 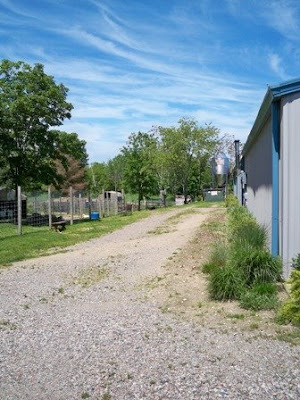 Large roaming pens are home to 96 goats including Saanen and Alpine breeds. Gentle kids with pristine white coats welcome visitors at the fence line. There is a state-of-the-art dairy kitchen on the premises. Catapano Dairy Farm is home to 96 goats and a state-of-the-art dairy kitchen. “There is no other place like this, because of the uniqueness of being on the North Fork, and in a lot of ways, we did it at the right time, because now goat cheese is really cool,” says Karen. How does Catapano Dairy achieve its luscious, award-winning flavor? “The food is of paramount importance,” says Karen. “I think that’s why we won, because we feed the goats so carefully.” Similar to other aspects of the operation, they found the right nutritional balance with some experimentation. 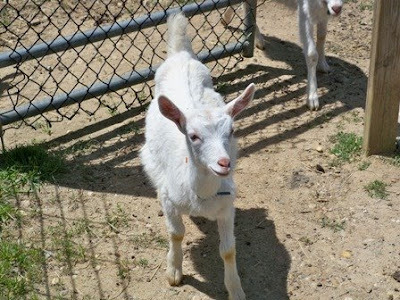 The herd of goats at Catapano Dairy Farm includes white Saanen and Alpine breeds. Of course, the skill of the cheese maker is a significant factor in the flavor. Michael Catapano maintains a medical practice to support the farm, and creates the award-winning cheeses. His “Peconic Mist” blue cheese was awarded first place in the American Cheese Society’s 2008 competition. He is constantly testing new recipes. Their favorite cheese recipe has yet to be sold. Michael has been experimenting and has produced seven huge wheels of an Italian-style Parmigiano-Reggiano. During the winter months, the couple tends to repairs, and Karen is kept busy with “kidding season” in early spring. She also produces a line of handcrafted soap and skin care products called “The Delicate Doe.” Goat milk is rich in proteins and naturally occurring fats which makes it an excellent moisturizer. Their reputation continues to grow. Catapano Cheese is offered as a cheese share at the Sang Lee Organic Farm and will be sold this summer at a regional food market just opened at the South Street Seaport in New York City. North Fork restaurants offer the cheese on their menus and one even features a Catapano Burger. Karen and Michael Catapano have earned their place in the agricultural fabric of Long Island’s North Fork. 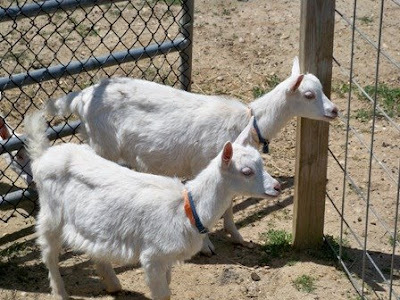 Pristine white Catapano goats greet visitors. Catapano Dairy Farm is located at 33705 North Road (Route 48), Peconic, NY, 11958. What a great story! 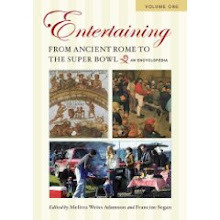 The Catapanos sound amazing and I love hearing how all their hard work (and especially the care that went into the goats' diet) is paying off. Once again, I feel like I've tagged along on one of your wonderful day trips. I have a friend here in RI who has just begun her own experiments in goat cheese making (breeding her own goats, too), and it's a laborious process that requires much patience. I also think it takes courage to change careers, so hats off to the Catapanos for all they have achieved. I have you in my reader now so I wont be missing anymore posts - the fresh ricotta looked great! I love this story. It combines so many things dear to my heart - exemplary animal welfare standards,attention to detail in the way the cheese is made, and a great tasting product at the end of it. So good to see commercial success based on such strong values. Colette. I loove goat cheese. What I wouldn't give to spend a day at a dairy like this! What a wonderful culinary tour again, T.W. Their story is so amazing...and it reminds me of what I am doing, keeping a day job to finance the business...and then realize you have to buy more equipment otherwise you will not get anywhere....very inspiring! So nice that you got to hang out on the North Fork, it's so beautiful there, so many farms, etc. Can I officially wear white pants now? I have been waiting all year! without a doubt the best goat cheese around...the first time we bought their feta cheese, it never even made it home! you've done a great job of portraying their story ... I feel as if I've spent the day there as well. What a great cheese! Bless those little goats and their milk. Your finds and reports are really incredible-thanks so much for giving us all the info! Their goat cheese looks terrific. I really miss good goat cheese like we had in Provence. There are goat farms here in the mountains and we had hoped to find good goat cheese - but no luck. A vendor had some homemade goat cheese at the farmers market downtown but it resembled cottage cheese and wasn't what I wanted at all. Lucky you to have such wonderful foods in your backyard. It's wonderful to see such nice people with such a superb product succeed. Bravo, Karen & Michael! I really enjoyed this post, TW. The Catapano's story is really inspiring and humbling. I admire their commitment, persistence, and passion. lovely article TW. Like any startup, this sounds like a vast amount of work, but it's wonderful to hear of their success. What a great blog post! I loved seeing all of the pictures--especially of the little goats. I'll definitely have to check this out next time I'm in NY. For now, though, I'm just ready to eat some goat cheese! Excellent story. Follow your dream. Pay attention to detail. Use the best ingredients. Take great care of the animals. Best wishes for continued success to Karen and Michael, I hope I get to taste their cheese one day.